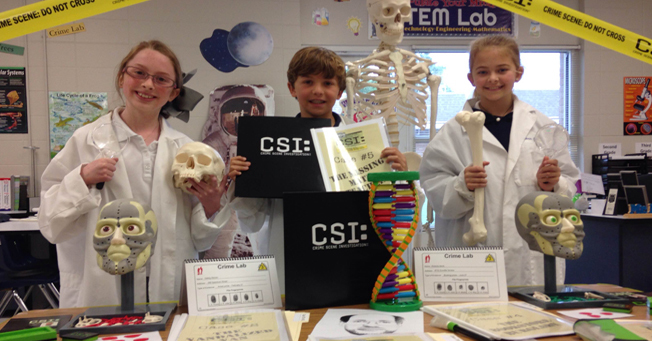 This week our fourth graders will begin a Crime Lab mission in STEM. During the next few weeks, students will rotate through five unique crime scenes which the crews will have to investigate and solve. These include “The Field Trip Forgery” (handwriting analysis), “The Vandalized Van” (footprint and tire impressions), “The Locker Room Larceny” (fingerprinting), “The Bookstore Burglary” (DNA profiling), and “The Missing Math Teacher” (facial identification and reconstruction). With each crime, the students will learn about a specific area of forensic science, perform a skills-building activity, conduct an investigation based on evidence and a list of suspects, and maintain an investigator’s notebook to find out “whodunit.” This is going to be an exciting unit for our young CSI agents!